Why do we remove an eye? The reasons for removing an eye are variable. In most cases we remove an eye because there is little or no vision and the eye has become uncomfortable. It might also be that the appearance of the eye is not acceptable to a patient and that by removing it we can provide a cosmetic shell that will give a more symmetrical appearance. In some cases there may a tumour within the eye that requires removal. What are the different options available when removing an eye? When removing an eye there are several decisions to make. This includes how we remove the eye, and how we fill the eye socket. When removing an eye we can either eviscerate the eye or enucleate the eye. In both cases once the eye is removed an implant is placed at the back of the eye socket and the tissue is closed over the top. A custom made artificial eye is then placed in the eye socket at 6 weeks following surgery that will be matched to your other eye. This shell can be taken out and cleaned. The sclera is opened and an orbital implant is placed. The sclera and lining of the eye is then closed over the top of the implant to prevent any exposure in the future. A cosmetic shell is then placed over the front of the healed socket. Initially a clear conformer is placed in the socket. This is then replaced at about 6 weeks for a shell that matches the healthy eye. The shell can be taken out regularly and cleaned. The artificial eye team will show you how to do this. The muscles around the eye are not detached and therefore movement after surgery of the artificial eye is improved. The sclera that remains acts as a barrier to the orbital implant and helps to reduce subsequent exposure. The surgical time is reduced. By leaving some of the eye behind (the sclera) there is a greater risk of sympathetic ophthalmitis (SO). This is an immune condition whereby the immune system reacts to the contents of the eye that has been removed and can then cause a reaction in the good eye. This can cause disruption to the vision in the good eye. Fortunately the risk of SO is extremely rare and occurs in under 1 in 1000 cases of eye removal. Enucleation surgery involves removal of the entire eye. The muscles that normally move the eye are detached from the wall of the eye and the whole eye is removed. An implant is then usually placed at the back of the eye socket. 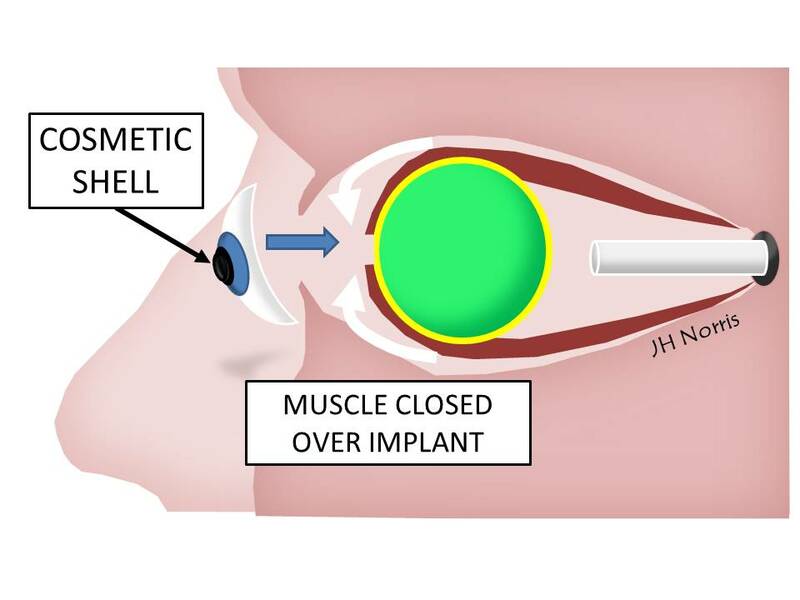 The muscles that move the eye are then attached to the implant. For the first 6 weeks a clear shell is put in place. A cosmetic shell is then placed in the socket once it has healed – this will be matched to the healthy eye. The whole eye is removed and so the risk of sympathetic ophthalmitis is reduced. In cases of ocular tumours there is less likelihood of tumour recurrence. The surgery takes longer to perform. There is an increased risk of implant exposure. Movement of the cosmetic shell is reduced. What is the orbital implant? The orbital implant is needed to maintain volume in the eye socket. It sits behind the lining of the eye socket and shouldn’t be confused with the cosmetic shell which is removable and sits in-front of the tissue lining the socket but behind the eyelids. There are many different implants available which each have their own risks and benefits. The commonly used implants are acrylic, hydroxyapatite (coral) and porous polyethylene (Medpor®). The use of any given implant depends on a number of factors including your age, the size of the socket, the degree of possible implant. The reason for eye removal can impact the choice of orbital implant. In some cases we will use fat from your abdomen instead of an orbital implant. This is usually in cases when the risk of using the other types of implant is too high. What are the risks of orbital implant? Exposure or extrusion of the implant. Bruising within and around the eye socket. Swelling of the lining of the eye socket. One of the most serious risks is sympathetic ophthalmitis which is fortunately very rare. The range of movement of the cosmetic shell is difficult to predict and will not completely match the other eye. In the long term the shell can sink back in the socket . This is known as post enucleation socket syndrome. Some complications may require removal or exchange of the orbital implant (see eye socket reconstruction). Prior to surgery the team will see you in clinic and discuss the treatment options with you at this stage. If you are happy to go ahead with surgery we will normally consent you for the operation and you will need to sign a form. Often when after eye socket surgery you will need to stay in hospital overnight and will need to bring some overnight clothes and toiletries for the duration of your stay. We advise that you also bring in your medications with you when you come into hospital. Sometimes you may have to wait for a few hours before your surgery is performed and this depends on your position on the operating list. A general anaesthetic is usually preferred when performing eye socket surgery and the anaesthetist will also come and see you. Often after eye socket surgery your eye will be padded for 3-4 days. You will be booked for review within the first week to have the pad removed. In the first few days after surgery you will be prescribed an oral antibiotic. You may feel nauseous or even feint at times shortly after surgery to the eye socket. On removing the pad you will be able to see a clear conformer (shell) in the eye socket which will stay in place for the initial 4-6 weeks. Your eyelids may be a little swollen and this will usually settle within a few days. Mr Norris will show you how to clean your eyelids and socket and how to apply an antibiotic ointment. We will give you some antibiotic ointment (usually Chloramphenicol) to apply to the wounds and to the eyes after the surgery to help protect against infection. We do not normally need to remove any stitches. You should avoid any strenuous activity including lifting heavy objects for at least two weeks and avoid swimming for three weeks after surgery. Usually patients are quite anxious after having surgery near their eyes and most problems do settle with time. If you developed a reduction of vision in your other eye or if there is bleeding or severe swelling then you should seek medical attention immediately. Mr Norris will happily see you with any problems. Please refer to the emergency contact page (under the header ‘Contact’) if you need advice.